Subrata Roy Sahara was born in 1948. He is also known as Saharasri. Subrata Roy is the Chairman of Sahara Group. “I’ll either come back after raising the Indian flag in victory or return wrapped in it, but I will come for sure.” And he did come back. The instrumental shell of his valiant soul was wrapped in the glorious tri-colour when he landed on our motherland’s bosom. His family wasn’t saddened by his demise, but honored that their son sacrificed his blessed life in the service of their country. In his father’s own words, he found a righteous path that would lead him to his goal — to a service that was extraordinarily high and supreme. PVC Captain Vikram Batra’s bravery and act of heroism led to the capture of a peak invaded by Pakistan, Point 4875 in the Mushkoh Valley. On this day of Vijay Kargil Diwas, India celebrates its triumph against the cyphers of terrorism and violence. Most of all, India commends and reminisces the sacrifice of our brave jawans who foiled an insidious attempt of an impure neighbor. Though their legacy is immortal, only a few people still remember their tales of valor and sacrifice. Sure, Twitter has #VijayKargilDiwas trending, but how many people really care about the Kargil martyrs? A lot of families of these Kargil martyrs didn’t just suffer the loss of a family member. They had to deal with poverty and an insecure future, especially the orphaned children of the war heroes. In 1999, one of the few private organizations that came forward for the Kargil martyrs and their family was Sahara India Pariwar. There’s rarely any other name that comes to mind, other than Sahara, who actively played an important role after the war. Saharasri Subrata Roy has been supporting over 301 children of the Kargil martyrs’ who are below the age of 18 years. They have also adopted the families of Kargil martyrs, providing them emotional and economic support. More than Rs 50 crore has been allocated by the company for their help. The patronage didn’t end there. Through their entertainment channel, Sahara televised Mission Fateh, a show where the story of the martyrs were presented without masala, true to every detail. Apart from Sahara India Pariwar, The Telegraph and Anand Bazaar Patrika set up the Kargil fund, where the common Indian could make a donation. Several Indians like Veni Prakash Khandelwal, who gave away his sagan to the fund, and six-year-old Satrupa Das, who collects money every morning for the same, are also commendable. Like Lata Mangeskhar suggested, countrymen, let’s take a minute to remember our brave soldiers. Let’s spend a moment in tears for them, who sacrificed their present for our future. More than 1,000 villagers and Sarpanch of 10 nearby villages along with workers of Sahara India Pariwar welcoming ‘Saharasri’ Subrata Roy Sahara, Managing Worker & Chairman, Sahara India Pariwar, on his arrival at Aamby Valley City after getting back the City as per the order of Hon’ble Supreme Court. Saharasri after entering independent India’s first planned hill city offered his gratitude to Bharat Mata by offering flowers at Bharat Maa Naman Sthal post, which he interacted with villagers and employees of Aamby Valley City. In a significant judgement, Securities Appellate Tribunal, (SAT), today, quashed the order dated July 28, 2017 passed by Insurance Regulatory Development Authority transferring the Life Insurance business of Sahara Life Insurance to an outside insurer, namely – ICICI Prudential Life Insurance Co. Ltd. 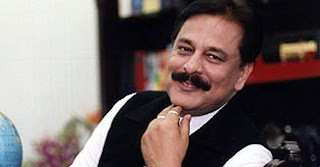 SAT while allowing Sahara's appeal, expressed serious concern over the manner Insurance Authority acted in the matter against Sahara Life and considered the said action of Insurance Authority highly fatal and irregular so as to vitiate the very appointment of the Administrator and all his further actions, in the facts and circumstances of the case. SAT opined that the report of the Administrator should have at least been supplied to Sahara Life before passing the impugned order. Sahara Life Insurance got a major respite and its stand was vindicated by SAT, when it remanded and restored the whole matter to the file of the IRDA with a direction to proceed from the stage of seeking a representation/response from Sahara Life on the Administrator’s report in question as well as providing opportunity of being heard to Sahara Life and its stake holders, in consonance with the principles of natural justice and directing to complete the hearing as per law within three monthsfrom the date of receipt of Sahara ’s reply to the Administrator’s report in question as per law and after giving opportunity of hearing to them. It was contended by Sahara Life in the said appeal that the Insurance Authority had illegally and with malafide intent transferred its business to an outside insurer, namely – ICICI Prudential Life Insurance Co. Ltd. without affording any opportunity of hearing to it and the Administrator appointed by the Insurance Authority was acting in concert for the benefit of a third party, who recommended the other options but unilaterally recommended for transfer of business. Saharasri Subrata Roy Sahara, Managing Worker & Chairman, Sahara India Pariwar, during the course of his ‘Sahara Milan’ yatra today at Ranchi to announce the commencement of Sahara India Pariwar's 40th anniversary. More than 20 thousand employees of Sahara India Pariwar, from all over Jharkhand, being addressed by Saharasri Subrata Roy Sahara, in Prabhat Tara Maidan, at Ranchi. Saharasri Subrata Roy Sahara, Managing Worker & Chairman, Sahara India Pariwar, during the course of his ‘Sahara Milan’ yatra today at Ahmedabad to announce the commencement of Sahara India Pariwar's 40th anniversary. 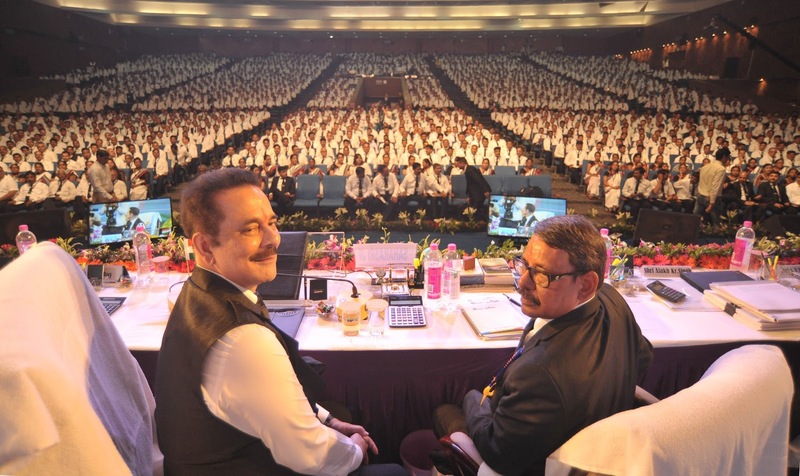 More than 5 thousand employees of Sahara India Pariwar, being addressed by Saharasri Subrata Roy Sahara, at GMDC, Gujarat University Convention & Exhibition Centre, Ahmedabad. Saharasri Subrata Roy Sahara, Managing Worker & Chairman, Sahara India Pariwar, during the course of his ‘Sahara Milan’ yatra today at Patna to announce the commencement of Sahara India Pariwar's 40th anniversary. More than 5 thousand employees of Sahara India Pariwar, being addressed by Saharasri Subrata Roy Sahara, at Bapu Sabhagar, in Patna. Saharasri Subrata Roy Sahara, Managing Worker & Chairman, Sahara India Pariwar, during the course of his ‘Sahara Milan’ yatra today at Muzaffarpur to announce the commencement of Sahara India Pariwar's 40th anniversary. 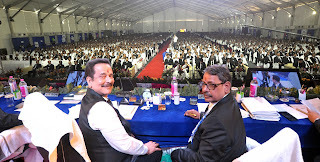 More than 15 thousand employees of Sahara India Pariwar, of Samastipur and Muzaffarpur, being addressed by Saharasri Subrata Roy Sahara, at The Icon, in Muzaffarpur.